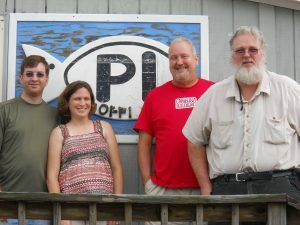 A small cadre of hams invaded Core Banks (Portsmouth Island), North Carolina (NA-067) for the 2011 Islands on the Air (IOTA) contest as N4I. Although many others activated NA-067 from other islands that were much easier to get to, Eric W4OTN, Amanda KI4IWS, Bill KG4CXY, Leslie, and Robyn WA4WPD packed gear up in a few vehicles and took a boat over to the island where we took refuge in a rental cabin provided by the National Park Service. 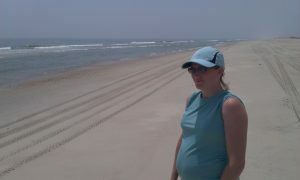 Officially part of the Cape Lookout National Seashore, Core Banks is a strip of barrier island off the coast of North Carolina just south of Ocracoke Island and north of Morehead City. 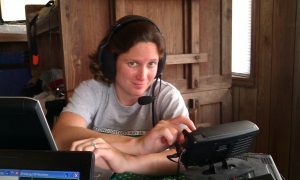 The cabin is actually a duplex; we rented both sides and used one for our radios while the other side held our food and sleeping quarters. 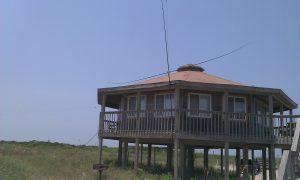 Antennas included a dipole and a vertical loop that faced the Atlantic Ocean. 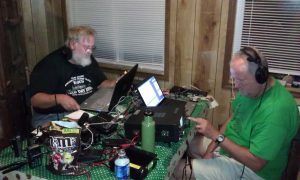 Overall, signals were good and 111 contacts were made to 40 DXCC entities using phone, CW, and digital modes during the operating period. Unfortunately, we really aren't contesters and spent more time conversing than transmitting as one could tell from the low QSO count. Overall we had fun operating which is what matters.